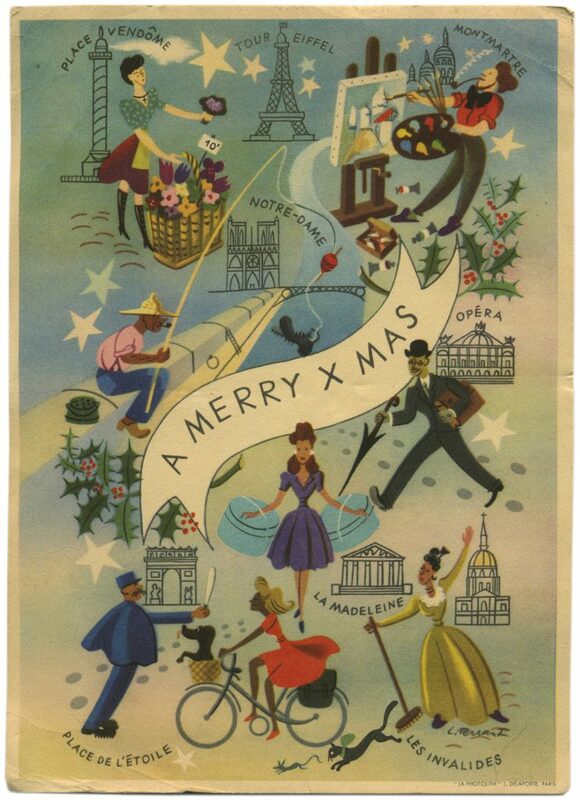 Carolyn Porter | "I have already received the fruitcake..."
See/read a postcard mailed November 24, 1944 from Paris. Paul O. Conrad, Paul Odell Conrad, Winston-Salem, Paris, WWII, WW2, postcard, Carolyn Porter, Marcel Heuzé, postcard collection, WWII love stories, Books like "All The Light We Cannot See", Books Like "Sarah's Key"
There are several reasons I was tickled to find this illustrated postcard. I have already received the fruitcake. Thanks very much. It was very good. We don’t get much of such things. Tell Lucas Jones Hello for me. I haven’t written him yet. Bet he is having a good time, no matter where he is. I found this postcard on eBay. Most eBay purchases arrive without any kind of note about the object or the seller. But Odell’s postcard came with a long note. The seller, Julianne, was liquidating a lifetime of acquired items to reduce the amount of work her children will have to do to close her estate. “Collecting things with historic value has always brought joy to my life. I often ‘rescue’ things from the landfill because I know they have historic value (or they do in my eyes). I like collection toys because I didn’t have many when I was a child. “As I attended estate sales and auctions and survey all their “stuff” laid out in such an impersonal manner, I considered their life: what they did, what they liked. Much of their personality was on full display. … Most people (buyers)…didn’t give a single thought about the person behind all these possessions. I am so grateful Julianne found—rescued—this card from the landfill. I’m so grateful for the people who work to preserve history. And I was particularly touched to find this card because it is by the same illustrator as postcards I found years ago. View those other postcards here.